In this series, The Fix, Entrepreneur Associate Editor Lydia Belanger shares her conversations with founders and executives whose solutions to inefficiencies can inspire others to find new ways to save themselves time, money or hassle. This article is included in Entrepreneur Voices on Growth Hacking, a new book containing insights from more than 20 contributors, entrepreneurs, and thought leaders. That’s what many new customers said about Updater in its early days. They’d find out about the product, a software platform that allows people to keep track of their to-do list before moving, but often just a few days before their move date. By then, they had already taken care of setting up new utilities, changing their addresses and many of the other hassles moving requires. Having access to Updater earlier could have kept them better organized and saved them hours of time. While the company’s executives were grappling with this issue, they spoke with leaders in the real-estate industry. They learned that property management companies, real estate brokerages and others in the space were struggling to help their clients and residents through the moving process. These players wanted to extend their services beyond just finding new homes for their clients. By teaming up, both sides could create a win-win solution for everyone. Updater wanted to connect with more customers -- and connect with them earlier in order to give those customers the best possible experience with its product. Real estate brokerages, property management companies, relocation services and others in the space wanted to better serve their clients by helping them find trustworthy moving companies and keep track of moving tasks -- in turn bolstering client relationships. 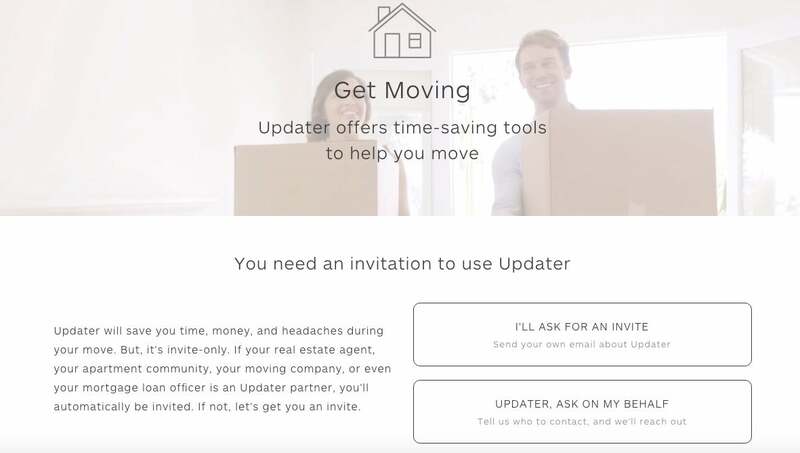 To solve its customer acquisition problem and attract users en masse, Updater adopted a new mindset: While its product serves movers, the real-estate industry, relocation services and even universities are now its direct customers. The company began establishing partners and licensing its software directly to them. This meant that, as of February 2015, the general public could not access Updater without a referral. The invite-only model gives Updater’s paying partners an advantage and adds an element of exclusivity, given that their clients cannot use the tool without their help. Updater allows its partners to co-brand the interface so that the software is customized. For example, agents can upload their photo, personalize their profile and check in with clients. Clients also can find localized information about the best moving services and utilities in their area. For those who want to benefit from Updater’s services but don’t have a referral, they can request one on Updater’s website. If that avenue doesn’t work, Updater provides free content for movers to help them avoid common moving pitfalls, know what questions to ask their real estate agent, discover trustworthy moving companies and more. Throughout 2014 and into the first quarter of 2015, the number of moves being processed through Updater was growing at a good pace: It leaped from 1,126 transactions to 4,559, or more than 300 percent growth in a year. But it wasn’t until the model changed in the second quarter of 2015 that Updater saw a huge spike. A couple of months after the company pivoted to invite-only, the number of moves being processed jumped to 38,502 -- more than 700 percent from the previous quarter. “We were able to simultaneously onboard five or 10 pretty big partners all of a sudden at once because we finally went live with that integration platform,” Greenberg says. “There was almost a waitlist, if you will, of partners who wanted to get on the platform, but couldn’t because we had not yet finished building the integration platform." The number of quarterly moves has continued to grow -- to 535,782 during Q2 2017. This is nearly a 1,300 percent increase from when the company pivoted the model two years ago. Today, Updater self-reports that it processes 11.68 percent of all U.S. moves. Partners refer clients to Updater an average of three to 10 weeks in advance of their move dates. For other businesses wondering whether an invite-only model is right for them, Greenberg suggests asking yourself where your customers are, and whether there are other businesses “a bit further up the food chain” who can be the liaisons between you and your end users. He also notes that he’s gotten inquiries from companies in the estate planning and funeral industries -- “other technology companies that are focused on a life event” -- about how to apply the model. Updater can’t just onboard new partners and expect them to do all of the work, of course. Maintaining such relationships is crucial to foster loyalty in the face of potential competition. Plus, the company has to check in regularly to make sure that those partners are getting their clients to take full advantage of the platform and that those clients are having a positive experience, explains Bill Cates, president of Referral Coach International and author of Beyond Referrals. As Greenberg explains, the largest team of employees within Updater is its client success team, which manages relationships with its partners and tracks closely to make sure that they’re getting a return on investment -- that Updater is helping them generate referrals, retain clients or improve resident satisfaction. Updater not only reminds its partners of how it’s helping them, but uses this information to learn what’s working well and what’s not.